It started with the Batmobile, Batman’s astounding car (which first appeared in 1966). Batmobile looks like a portmanteau of Batman and automobile, but both parts are more complex than that. Let’s start with Batman (at first, the Bat-Man). This is a straightforward compound of bat and man, referring to a man who has some of the properties of a bat. The compound has primary accent on its first element, with a lesser accent on the second, a pattern that it shares with Superman, Starman, and some other proper names, including the invention Jockstrap Man of a recent posting of mine. The pattern contrasts with other one that has an unaccented second element, as in Frenchman and salesman. Wienermobile is a portmanteau of wiener and automobile, formally similar to Oldsmobile. The element -mobile is on its way to becoming a libfix, in that it can now be attached to virtually any personal name, to jocularly denote a car belonging to that person: Zwickymobile, Arnoldmobile, etc. (and the Popemobile, of course). Now, back to Batmobile. Its first element isn’t just bat, referring to the creature, but is an allusion to Batman, the superhero — another libfix, this time prefixed (like bro-) rather that postfixed. In proper practice, the “bat” prefix (as in batmobile or batarang) is rarely used by Batman himself when referring to his equipment, particularly after some portrayals (primarily the 1960s Batman live-action television show and the Super Friends animated series) stretched the practice to campy proportions. The 1960s television series Batman has an arsenal that includes such “bat-” names as the bat-computer, bat-scanner, bat-radar, bat-cuffs, bat-pontoons, bat-drinking water dispenser, bat-camera with polarized bat-filter, bat-shark repellent bat-spray, and bat-rope. … When Batman is needed, the Gotham City police activate a searchlight with a bat-shaped insignia over the lens called the Bat-Signal, which shines into the night sky, creating a bat-symbol on a passing cloud which can be seen from any point in Gotham. The origin of the signal varies, depending on the continuity and medium. … The Batcave is Batman’s secret headquarters, consisting of a series of subterranean caves beneath his mansion, Wayne Manor. It serves as his command center for both local and global surveillance, as well as housing his vehicles and equipment for his war on crime. It also is a storeroom for Batman’s memorabilia. The Batplane, later known as the Batwing, is the fictional aircraft for the comic book superhero Batman. The vehicle was introduced in “Batman Versus The Vampire, I”, published in Detective Comics #31 in 1939, a story which saw Batman travel to continental Europe. In this issue it was referred to as the “Batgyro”, and according to Les Daniels was “apparently inspired by Igor Sikorsky’s first successful helicopter flight” of the same year. Initially based upon either an autogyro or helicopter, with a rotor, the Batgyro featured a bat motif at the front. The writers gave the Batgyro the ability to be “parked” in the air by Batman, hovering in such a way as to maintain its position and allow Batman to return. In addition, there’s a Batboat, a Batcopter, a Batcycle, and a Bat-sub. Batwoman is a fictional character, a superheroine who appears in comic books published by DC Comics. In all incarnations, Batwoman is a wealthy heiress who—inspired by the notorious superhero Batman—chooses, like him, to put her wealth and resources towards funding a war on crime in her home of Gotham City. 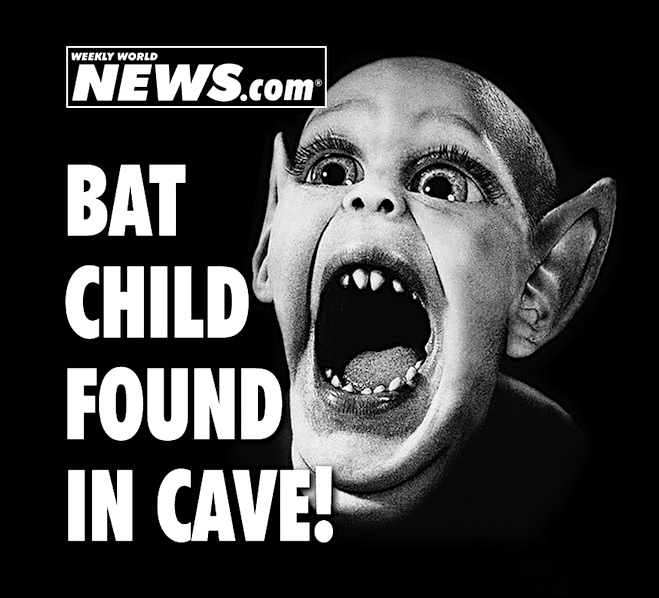 Bat Boy is a fictional creature who made several appearances in the defunct American supermarket tabloid Weekly World News. The Weekly World News published patently fabricated stories which were purported to be factual. Within the pages of the paper, Bat Boy is described as a creature who is ‘half human and half bat’. His pursuers, according to Weekly World News, are scientists and United States government officials; he is frequently captured, then later makes a daring escape. The original scientist who found him was named Dr. Bob Dillon. Matthew Daemon, S.O.S. (Seeker of Obscure Supernaturals) crossed paths with him on several occasions. This entry was posted on August 9, 2013 at 8:18 am and is filed under Combining forms, Compounds, Libfixes, Portmanteaus. You can follow any responses to this entry through the RSS 2.0 feed. You can leave a response, or trackback from your own site.